Your commitment to making India great is unquestionable. Your tireless promotion of Brand India is unparalleled in Indian politics. And your effort to run an honest government is commendable. Your energetic leadership and international appeal have brought India glory and investment capital. For that this country will owe you a debt of gratitude. But Sir, you came to power with the promise of being a transformational leader. That means going beyond just building roads or making India cashless. It requires changing India at its very core by limiting the size, power, and reach of the government, expanding economic freedom to allow entrepreneurs and businesses to take the risk to develop new products and expand production, and focusing the government’s energies on protecting people, their rights, and properties. The slogan “ small government and big governance” was a prominent part of your 2014 election campaign. This suggests that you understand and value the merits of a small government. It is, therefore, disappointing that the government today is bigger than it was three years ago and front and center in all aspects of economic and social activity. Let me illustrate this with four of your most recent ‘transformational’ ideas. The damage to the economy has been substantial. About Rs. 3 lakh crores have already been lost and our estimate is that the eventual loss will exceed Rs. 6 lakh crores or roughly 4% of GDP. At least 1.5 million jobs have been lost in just the first four months of this year including a 50% drop in employee hires in India’s startups (Center for Monitoring Indian Economy (CMIE) estimates). A complex ecosystem like the economy, with hundreds of stakeholders, cannot be centrally managed or controlled. That is why it is best for the government not to meddle in matters of commerce and economics. It can provide a limited regulatory role, but the kind of active role your government plays will certainly harm the economy. The demonetization decision reveals the grave economic risk that India faces under your leadership. It stems from your innate proclivity to manage and control things. It is abundantly clear that you did not seek expert advice, or if you did, you chose to ignore it. No sane economist would have advised you to demonetize 86% of the nation’s currency especially given there were other, more effective and less damaging, alternatives to addressing your stated objectives of black money, corruption, and counterfeiting. Your next “ transformational” idea was a needlessly complicated multi-rate, multiple-collection-point GST system when a simple single tax rate structure with one point of collection would have been far more efficient for increasing both revenue collection and compliance. The GST itself is an effective tax instrument, and about 140 countries use some variant of it. But your government has introduced undesirable complexities that diminish its appeal. Firstly, the GST is a consumption-based tax, which is a good idea only if it replaces an income-based tax. But your implementation of GST does nothing of that sort. All you have done is replace eleven business-killing indirect taxes with one big business-killing indirect tax. How can that be good for business and how can that improve tax collection? Secondly, the biggest advantage of GST is improved compliance that comes from chaining taxable transactions that make tax evasion easy to detect. But that happens only if the process is easy to administer. Your government has weakened that feature of GST with complications like differential tax rates across products which gives extraordinary arbitration powers to the government’s Revenue Service. The same corrupt tax officials that have for years terrorized businesses with arbitrary tax demands are now in charge of deciding whether a rubber ball is a rubber product taxed at 5% or a sporting good taxed at 18%. The GST structure will allow the government to control the final prices of all goods and services in India. As a result of differential tax rates, the consumption of goods, and the allocation of economic resources will shift towards industries with lower GST rates. Instead of the free market determining consumption and production decisions, the government and its bureaucracy will now control the allocation of resources. This is a frightening thought. In essence, the differential rate GST replaces the licenses and quotas of the License-Raj days by allowing the government to decide which industries to benefit with favorable tax treatment. Political and vote-bank considerations instead of economics will now decide which products get reduced GST rates. This would increase the power of the government and reduce economic freedom and is an example of big government at its worst. The efficient allocation of scarce resources like capital and labor that is best left to the free market is now being controlled by the government. India has paid a heavy price for socialist-style government planning in the past, and it is disappointing that your ‘transformational’ GST takes us back to those days. Much like the demonetization decision, the decision to rush through a complicated GST structure exposes your proclivity to ignore the advice of experts and a deep desire to “manage” and “control” economic outcomes. At least twenty other countries have unsuccessfully tried a multiple-rate GST structure and have eventually replaced it with a single-rate GST. Even your government experts at the Niti Ayog criticized the absurdity of multiple tax rates because it brings the government back in the business of picking winners and losers. Your third ‘ transformational ‘ idea was to waive Rs. 32,000 crores in farmers loans as part of the election rhetoric in the State of Uttar Pradesh. There is a cardinal rule in economics that “ THERE IS NO FREE LUNCH”. Someone has to pay for these loan waivers. An impulsive and politically-motivated decision of yours shifts the financial burden of paying these loans from the farmers who benefited from it to the taxpayers who derived no benefit from them. As of this writing, farm loans totaling about Rs. 1 lakh crores have already been waived in five states, and farmers in several other states are lining up demanding similar waivers. The total bill for all this would be about Rs. 2.5 lakh crores. To announce loan waivers of such magnitude at a time when the nation’s banking system is under severe duress is even more reckless than demonetization. It again suggests that either you are not getting good economic advice or that you choose to ignore it. I have to believe that Mr. Raghuram Rajan, the erstwhile RBI Governor, appraised you of the looming banking crisis in India. This crisis has the potential to derail not just India’s fragile economic growth but also your chances of reelection. Farmers have already racked up almost Rs. 6 lakh crores of unpaid balances in the KCC ( Kisan Credit Card) scheme. Additional loan waivers of Rs. 2.5 lakh crores is gravely irresponsible. History shows that great social harm can be done by a government that starts favoring one group over another. This is not what transformational leaders do. Your fourth ‘transformational’ idea was a ban on the trade of cattle for slaughter. This ban effectively shuts down two of India’s largest export industries–beef and leather. India is the world’s largest exporter of beef and the second largest exporter of leather goods. To make matters worse the ban comes at a time when India’s exports are at their lowest level in four years and have dropped by almost 36% since you came to power in 2014. It is nature’s design that bovine animals like cows and buffaloes have a useful life of about ten years after which farmers find it unprofitable to feed them. They trade them in the cattle market and use the proceeds to buy new cattle. This process of replacement has been going on for hundreds of years. But as with demonetization, GST, and loan waivers, it is hard to fathom why the economic importance of the cattle market has not been explained to you. Ironically, on one hand, you assist farmers by waiving their loans –at an enormous cost to the rest of the economy–and then you burden the same farmers with the responsibility of feeding farm animals that are no longer productive. It makes no economic sense, and it certainly does nothing to mitigate cruelty to animals. If anything, cruelty to animals would worsen as unproductive cattle are left to fend for themselves. So clearly this decision, like the others I have pointed out, was made not because it benefits a large majority of Indians, but because you had the power to do so. This is big government at its absolute worst. As a result of these ‘transformational’ ideas, the next two years will be a challenging period for the Indian economy. Tax terrorism will increase, the banking crisis will worsen and impede credit markets, and personal security will be under constant threat by groups who use the protection of religion to project power. 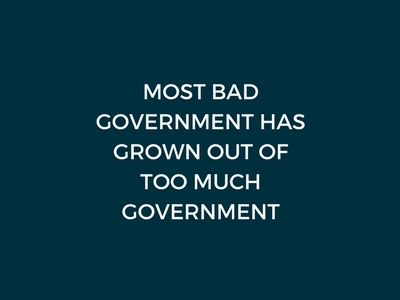 And as the government gets bigger, individual liberty will most certainly decrease. In part 2 of my letter, I will lay out a series of meaningful ideas for Mr. Modi to transform India.